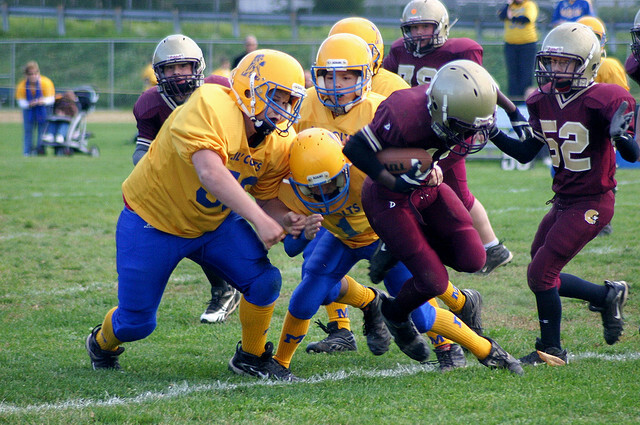 Pop Warner Football, the country’s largest youth football organization, announced changes to its rules this week. Beginning this fall, there will be restrictions on contact that occurs during practice drills. The organization says it is trying to limit the number of concussions suffered by young players. In some ways, changes like this present a conundrum for parents. 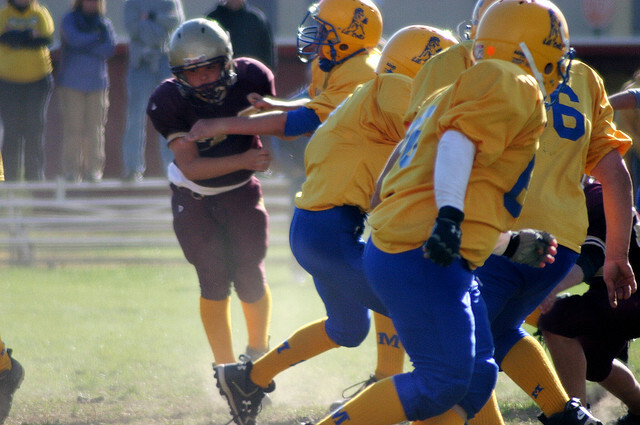 Trying to figure out if your child should play contact sports like football or hockey has become more difficult as the facts about certain injuries – especially concussions – have come to light. It’s a personal choice, but there are certain issues that have made the choice more daunting. As a reporter, I get an up-close view of football, hockey and other contact sports. You may feel badly when you see an injured player carted off during a televised game, but there is still a separation and the viewer is basically unaffected. That sense of separation disappeared for me after covering events such as Bears training camp. My eyes and ears became quite sensitive to the impact of injuries. When you observe practices just a few feet away from the action, the injuries are right in front of you. The depth of the problem may not be known immediately, but when you hear a player scream, see a shoulder dislocate or watch a player on the ground, unable to move, you know something is seriously wrong. This is not to say that a professional level of play is equal to that of children; but hitting on any level can produce bad results. I was able to ask two NFL head coaches if they would let their sons play football. Both said no. They cited the speed of the game and the elevation of serious injuries. I had these conversations a few years before the concerns of concussions became prevalent; I’m sure that new information would have strengthened their resolve. Roughly six or seven years ago my own son asked me if he could play organized football. He was about eight years old and it wasn’t hard for me to reach a conclusion about why those parental consent forms were not going to be signed. His size and temperament were a huge concern for me. Injuries, especially concussions, were another key factor. Luckily he didn’t protest too much. There were times he played touch football on the playground, but soccer became his game of choice. My reasoning may not be shared by parents who have played these sports; that is understandable. Many parents will argue that things are safer than they used to be: the equipment is better, the rule-changes have helped and practice methods have improved. In fairness, there are plenty of children who love playing full contact and who get through it unscathed. It’s also true that you can get hurt in just about any sport and you don’t want children to be fearful of everything. I’ll say this, though: You can fix a broken leg or replace a lost tooth – if your kid plays hockey you’d better have a good dental plan! But in my mind, the violent, concussion-causing collisions in certain sports have validated my decision about not signing that consent form for the only person I’m personally responsible for: my son.